This is pretty huge news. Wizards have finally made a huge back catalogue of classic Dungeons & Dragons modules, splatbooks and material available for download from DriveThruRPG and its sister sites. We've been waiting for some time for Wizards to do this, ever since they pulled their PDFs from the site citing file sharing as a major concern. Now they've done exactly the right thing and made their old stuff available, which will no doubt net them a huge amount of money. You can now get your virtual hands on everything from Basic Edition rules through to 4th Edition, all at really good prices. The Basic Edition rules themselves are only $4.99, which is a steal. However, due to high traffic the site is taking a beating and will probably on and off for a while. With the OSR market filled to the brim with D&D iterations, Wizards putting the originals out there is a very good move. 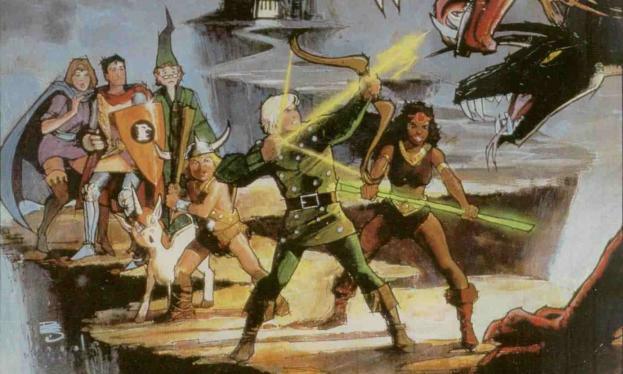 They know that there's a hankering for older editions, which is part of the reason why they're making D&D Next more 'grognard friendly', and they're capitalising, which is fair enough. The Trollmanac is out now at DriveThruRPG, bursting with Tunnels & Trolls goodness, including new kindred, character types, build options, GM guides, monsters, magic items and two micro solo adventures. This book collects some of the best posts on this blog that have been revised and put together in a tome that's positively brimming with T&T awesomeness. 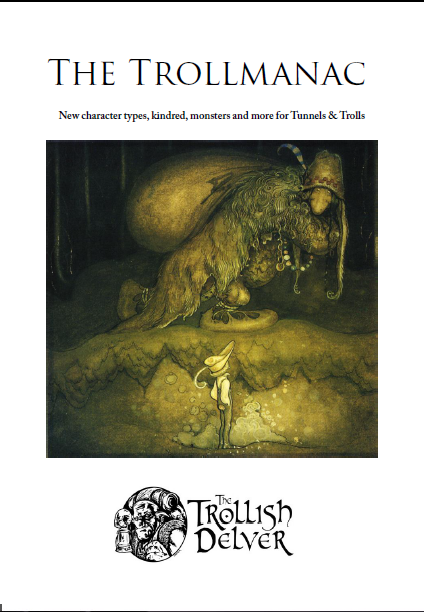 Tunnels & Trolls is going to be big this year, so why not take your game to the next level and treat yourself to The Trollmanac - it's only £1 - that's as much as a bag of sweets! Board game designer and RPG genius Lynn Willis has died after several years of illness. Willis is best known for being among the first employees of Chaosium, co-creating The Call of Cthulhu and writing some of the best work that the company has put out. Willis' full portfolio of work can be found here (it's huge). He was pretty much responsible for one of the best roleplaying systems out there and one of my personal favourite roleplaying games of all time. He also had a hand in creating the board game Arkham Horror. He will be sorely missed by the RPG community and my thoughts are will his friends and family. So do Willis a favour this weekend: play some Call of Cthulhu or at least read one of his books and remind yourself how much of a legend this guy is. Well played, Willis. Tin Man Games' second Fighting Fantasy title for smart phones and tablets is out now. House of Hell, the first modern horror gamebook in the series is currently exclusively available on Google Play. Like Blood of the Zombies, their previous FF effort, House of Hell has some lovely little features to make the game different from playing the physical book, including variable difficulties, amazing colour illustrations by Tim Sell, unlockable artwork and specially composed music. If you've never player House of Hell, which is in my opinion one of the best FF gamebooks ever written, then now is the time to sink your teeth into this demonic horror of a book. The story revolves around YOU, the protagonist, running into a ditch on a wet and stormy night - like the beginning of all good horror stories! You seek shelter in a large foreboding house with a creepy owner and ever creepier residents. Demons, undead and satanic puzzles await you as you venture into the House of Hell. 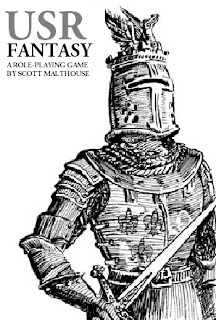 On Monday I gave you a brief look at USR Fantasy, but now I want to show you a little bit more about how it's coming together in a series of spotlight posts. Today I'll be looking at the druid, the caretaker of the wilderness and friend to all living things. 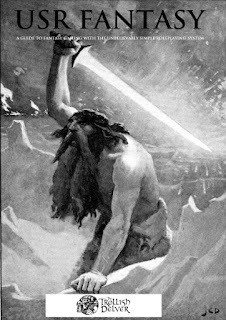 Druids are based on wits, which is the suggested primary attribute for this archetype. This is to signify their ability to create potions, create wilderness shelters and their knowledge of the natural world. Druids make great healers in your party and their suggested Commune With Nature specialism can be a huge boon on adventures. 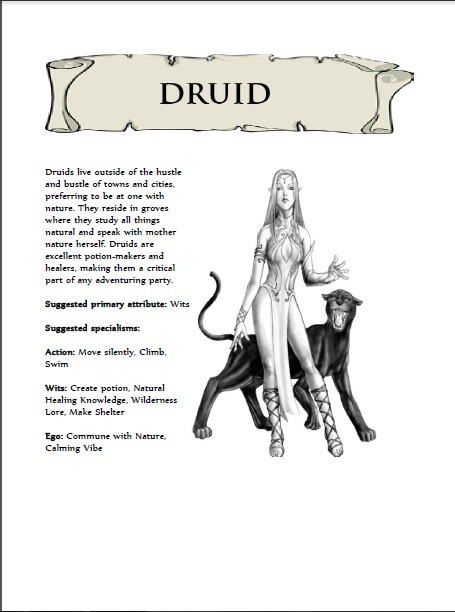 Druids lead generally hermetic lives, often taking residence in large hollowed out trees or makeshift tree houses. Because of this, Elves are generally the natural option for a druid character due to their affinity with nature. 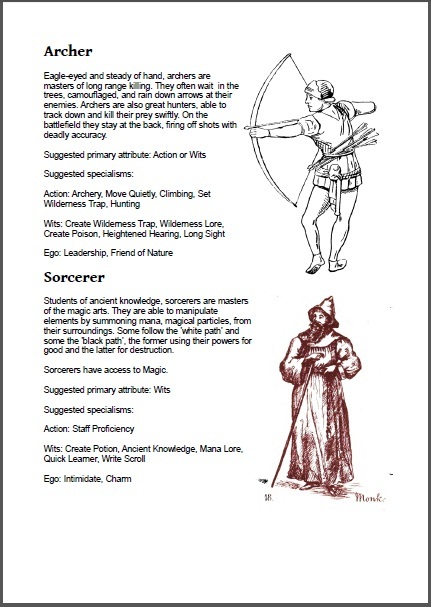 You can see my the suggested specialisms above that druids are pretty peaceful and you generally won't find them in the front lines caving in heads with blunt instruments, but that isn't to say all druids have to be flower-loving pacifist hippies. Some druids prefer to make poisons than potions and have learned how to ensnare their prey in the wilderness through natural traps. They know the best plants to create a sleeping draught and have animals on hand to help them carry out their dirty work. Weapon-wise, druids generally don't carry swords and maces, preferring slings or staves. 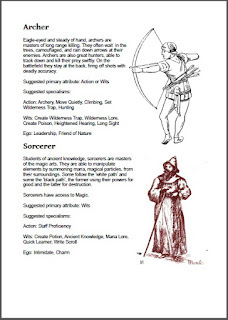 If you wanted to create more of an action-oriented druid, you could give your character specialist proficiencies in either of these weapons. However, at the end of the day, druids are expert healers, so they are more likely going to hang back and make sure the injured are being cared for than hacking at a bunch of goblins. There are some authors that like to waffle on for pages (looking at you, Stephen King) and there are others who distil stories down to their purest form, providing everything you need and trimming the fat. David Walters is certainly the latter and Samurai's Apprentice is evidence of that - 101 pages of lean, fast-paced adventure from beginning to end. Samurai's Apprentice is set in feudal Japan, 1600AD, just after the battle of Sekigahara. It's a time of shoguns, warlords and ninjas, one where war is commonplace and battles bloody. Kami is a young boy living with his grandfather in a small farming village, dreaming of one day joining the ranks of the samurai. However, he realises that this could never happen as one must be born into nobility to become one of these fierce and noble warriors. But when he stumbles across an injured samurai, Shimayazu, his life is changed completely and his training begins. Like any good adventure, Samurai's Apprentice is about the protagonist's personal and physical journey. We follow Kami as he matures under the keen guidance of his mentor Shimayazu, all while they travel across Japan to confront Lord Tokugawa, the shogun who led his army to victory over the Toyotomi clan of which Shimayazu is a loyal member. Along the way we meet some interesting characters who are well developed throughout despite the book being fairly short. In fact, the character of Yanama has more intricacies than many characters in full-blown 400 page novels, and she's only a secondary character. The book is made up of a series of very defined scenes. There are rarely any 'bits in between' that would serve to slow down the pace - everything moves likes a freight train from the get-go, never letting up or feeling boring. The action scenes are well-written, leaving enough to the imagination without having to be explicitly gory. People are run through with katanas, pierced by darts and decapitated, which is everything one should expect from a book about samurai. The only disappointment, really, is Kami, who is like every other headstrong 'chosen-one' in literature, without much depth aside from really wanting to become a samurai. This aspect of his personality is never really explained and it would have been nice to dive into his psyche once in a while. Still, Kami certainly does grow and with two more books in the series there is still chance for him to expand as a character. It would have also been nice for the book to be a bit longer, as there are some really interesting characters and it's such a wonderful setting that this feels like a just a brief peek into this world rather than letting the reader live and breathe it. Then again, for such a small price for such a great book this can easily be overlooked. If you have any interest at all in semi-historical fiction, especially in a Japanese setting, then you should definitely read Samurai's Apprentice. It's a heart-pounding adventure with some great characters and an interesting setting, and it will only take you a few hours to read. There's no doubt that most Avengers fans have been speculating as to whether Agent Coulson actually did fall at the hands of Loki in the film, but now it looks like it may have been tricksy Nick Fury pulling the strings as usual as news emerges that S.H.I.E.L.D will take place after the events of The Avengers. 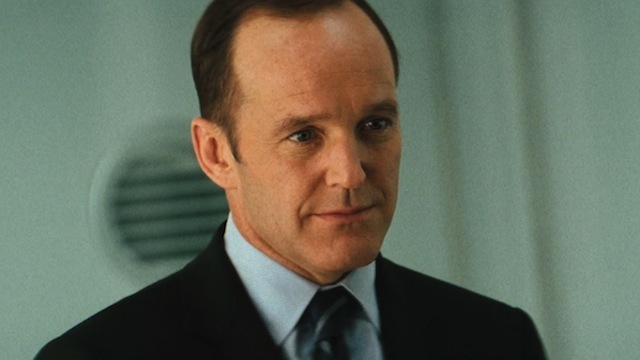 We already know that Clark Gregg will be reprising his role as the unsuspecting yet uber-badass agent in the new series helmed by Joss Whedon, so it now seems very likely that the whole Coulson being dead thing could have been a ploy to unite the Avengers after all. How very Fury. The news comes after IGN interviewed ABC president Paul Lee about the new series. He said: "There is no question that it is part of the Marvel Universe. In fact, the story takes place after the battle for New York." Evil Dead will be out in the Spring, but until then here's a sneak peak with the red band gory-as-all-hell trailer of the undead-thwacking video nasty. Curiously, unlike the last trailer, we don't see much of the main female protagonist - it's mostly focused on some hairy dude who opened the Necronomicon. Still, there are tonnes of nods to the original two, including the teased-at tree scene, hand sawing, a similar trapdoor sequence from Evil Dead 2 (Henrietta in the basement) and a scene where one of the guys' reflections changes into something sinister. The news that the wonderful Dotter of Her Father's Eyes by Mary and Bryan Talbot has won a Costa literature award for best biography has spread throughout the mainstream press, and with this news comes the depressing realisation that people still don't understand comics. Channel 4 News ran the story, complete with a cheesy comic book skit that felt more awkward than all of Hugh Grant's acting roles combined. Bizarrely, they start going on about comic strips for some reason, which is like a story about a new production of Hamlet being compared to a Fast Show sketch - it's wrong and out of place. I love comic strips, but to compare something like The Far Side to Watchmen is ridiculous. They then go on to say that comic 'strips' have never been about literature in the past despite citing V For Vendetta as one of these past comics. The reporter asks Bryan, who is a legend in the comics industry, when comics stopped being just a thing for 'spotty teenagers', in which he deftly responds by talking about The Dark Knight Rises and Watchmen which took off in the mid-eighties. Don't get me wrong - it's good that the press is reporting on 'serious' comics but they still haven't shaken this image of comics being for kids. Go into any comic store now and leaf through the books sat on the rack. You will find very few comics that are actually marketed towards children. Sure, you have Marvel Superhero Squad and the wonderful The Phoenix, but most superhero comics aren't aimed at children. Their stories are usually complex, their themes mature and their nature is somewhat violent. As the Forbidden Planet blog points out, the press tends to look at comics as a bit of a dirty word, like something you're not sure you should be saying to your grandmother. The Guardian used all sorts of weird variations in their report, like 'graphic work', 'graphic medium', and 'comic genre', without realising that it's okay to think that comic books can be read by fully grown adults with mortgages and marital problems just like any other book. So, mainstream media - please stop talking about comics like they are all for pre-pubescent kids and geeks. Serious comics dealing with heavy issues have been around for a long time now and it does the creative people that work on them as a living a disservice to paint them with one brush. However, do talk about comics. The more you do it, the more 'normal' it becomes and the more people will start appreciating how fantastic they are. I love it when a new Fighting Fantazine is released. Issue 10 has hit the web and you can read your copy for free. 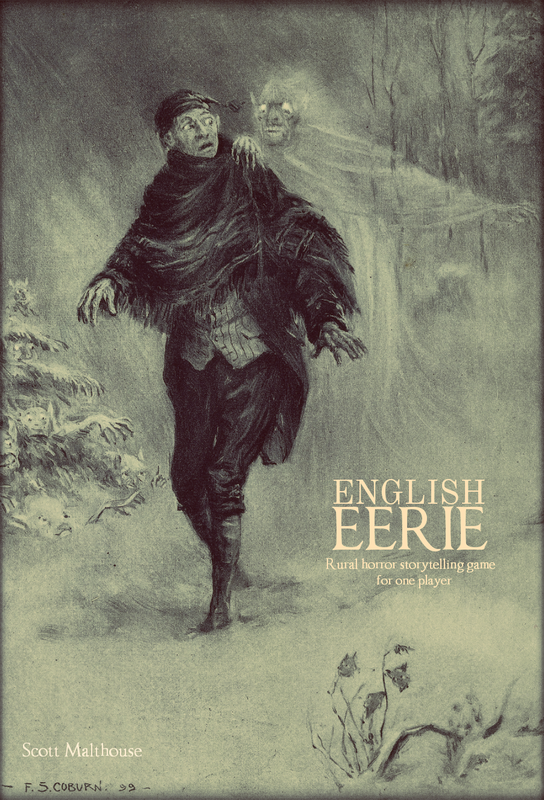 This edition is absolutely stuffed to the brim with great content, from the 30 crowdsourced reasons why we love Fighting Fantasy, to some great articles by friends of mine, like Stuart Lloyd and David Walters. Of course, you have the usual FF adventure to embark on as well as a news section that will leave you in no doubt that gamebooks are back, baby! Download it here - you'd be mad not to. Today's the day, boys and girls! I woke up to an email from creator Ken St. Andre informing me that Deluxe T&T is a go on Kickstarter and as of writing this has already got $9,395 with a goal of $26,000. There are absolutely loads of incentives for pledging your hard earned moolah, including coins, character portraits, getting to name an island and playing a game with the team. So what's Deluxe T&T all about then? Well, it's T&T as we all know and love but with more. For the first time ever we're getting full details about places in the Trollworld, meaning we now have a default campaign setting. Furthermore, the new hotness with be backwards compatible, meaning all the Trollish Delver Games books you own won't become defunct. Oh, and there's a ton of new art by Liz Danforth to ogle at. If you're a T&T fan already, Deluxe is meant to be the definitive edition, which means you should totally donate. If you've never played or even heard of T&T, where have you been? It's only one of the best systems out there, a game that has a sense of humour and one with an excellent community. I'll keep you updated with the funding - but tell your friends. Tell everyone! Get this funded. We're edging ever closer to being able to fund Deluxe Tunnels & Trolls, as the team has announced that they have submitted the project to Kickstarter for approval. They have released a sneak peek at one of the possible incentives for funding, including these coins from Trollworld, which are pretty nifty. Steve Crompton has also given a preview of the new map of Trollworld which looks equally great. I'll be announcing if and when the game goes live on Kickstarter, so put some money aside because you're going to want to fund this piece of fried gold. Delicious. I hope however you decided to celebrate (or didn't) you had a great end to 2012. I just wanted to wish you all a happy and prosperous 2013, a year that's going to bring a whole load of geeky goodness, from Star Trek Into Darkness and two new Marvel movies to a plethora of digital gamebooks. Over here I've got some cool stuff cooking, like a new Peryton project for mid-year, the Blackstorm gamebook for Adventurer and some USR goodies. 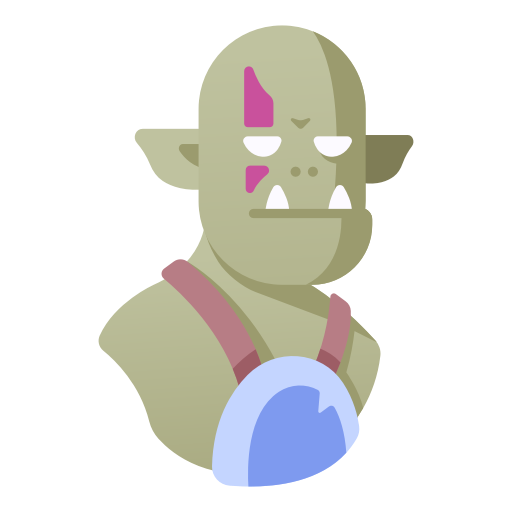 Finally, I wanted to say thank you to everyone who reads my little blog - you've made 2012 the biggest year for The Trollish Delver so far and I really appreciate all the comments and emails I get from you guys. I've been lucky to have made so many great new friends this year in the blogosphere and the gaming industry, so here's to more of that sort of thing in 2013.